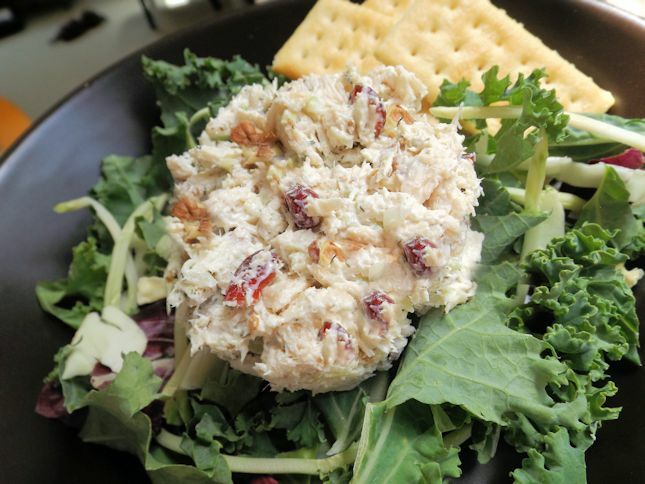 Today’s chicken salad selection is Cranberry Pecan Chicken Salad. Why so much chicken salad these days? I have been working around the house and yard in the mornings and when lunch comes I want something fast and easy. Previously, I baked chicken, chopped it, and froze it so that has been the go-to lunch. Today, I did the math for you and made two cups instead of one. This salad may not be world-famous but it is very good. It might be a contender for future fame and glory. I ate it on top of baby kale and other super greens. They are not my favorite greens but I guess my immune system will thank me. Use a food processor to finely chop the celery. Add the pecans and chicken and pulse to desired texture. Remove chicken, celery, and pecans to a bowl and stir in the mayo, sour cream, fines herbs and dill weed. Add the cranberries. Season as desired with salt and pepper. p.s. My fines herbes came from The Fresh Market spice section. Fines herbes are a mixture of parsley, chives, tarragon, and chervil.